McFarland pleaded guilty in July to wire fraud charges related to his failed April 2017 music festival in the Bahamas. The organizer of a failed Caribbean music festival was sentenced Thursday to a combined prison term of six years in prison for fraud. 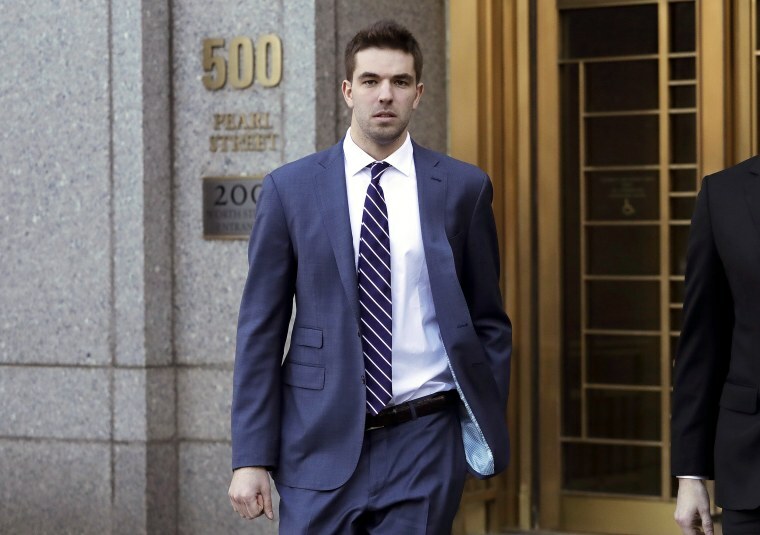 Billy McFarland, 26 was taken into custody following the sentencing in federal court in Manhattan for his role in the Fyre Festival, a music concert that was supposed to place in the Bahamas in April 2017. People paid thousands of dollars for tickets and accommodations to what was supposed to be a luxury musical festival in the Caribbean, but upon arrival were met with FEMA tents and cheese sandwiches and no concert. Celebrities such as Kendall Jenner and Bella Hadid endorsed the event on their social media pages. Fyre Festival cost investors, including rapper Ja Rule, $26 million — roughly the same amount the judge ordered him on Thursday to forfeit. McFarland apologized during his sentencing and said that a "fear of letting everybody down" drove him to make mistakes. "I made decisions that were a slap in the face to everything my family tried to teach me," McFarland said in court. McFarland pleaded guilty in March to wire fraud charges relating to the festival and in July pleaded guilty to various fraud charges stemming from a separate ticket selling scam. McFarland was able to make $150,000 in phony ticket sales to fashion, music and sporting events, according to U.S. Attorney Geoffrey S. Berman of the Southern District of New York. Prosecutors said McFarland repeatedly misrepresented the income of Fyre Media Inc to investors, claiming his company made millions off of talent bookings that in reality made less than $60,000. He also told investors in the Fyre Festival they would have the rights to payouts from Festival event cancellation insurance policies, though no insurance policy existed. Prosecutors had pushed for a 15-year prison sentence but McFarland's attorneys asked for leniency, claiming he suffered from mental health issues. A representative for McFarland said in a statement later on Thursday that they were appreciative of the "careful consideration" of the court. "And we’re grateful that the Court rejected the draconian sentence requested by the government and imposed a sentence that will allow Billy to spend the second part of his life meaningfully giving back to his community," the statement continued. Matthew Johnson and Associated Press contributed.